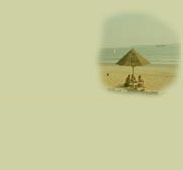 Goa, where the palm fringed shore of India's western coast spills over with the bounty of nature. And the strains of the mandolin mingle with the gentle lapping of the Arabian Sea, floating up to serenade the stars. 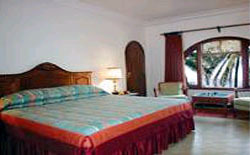 Savour these pleasures with the Taj, a sprawling complex of 88 acres on the Golden sands of Calangute Beach. 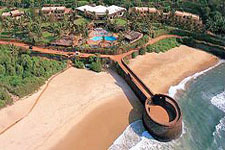 With 3 resorts: The Aguada Hermitage, Fort Aguada Beach Resort and Taj Holiday Village. Choose to stay at any of these three resorts and you can experience the fare at our 9 restaurants, delight in the water of our two freshwater pools or if you fancy, select a sport of your choice at our superbly equipped sports complex. Decorated in its own distinct style, each terrace suite is designed to create an unique tapestry of gorgeous colour and design. 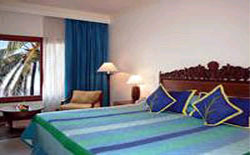 Exquisitely designed guest rooms overlook palm flecked lawns, a freshwater pool and a vast expanse of cerulean sea.